At the invitation of old friends, Jack and Michelle, on Monday, October 12, Tara Miller and Sam Brown will present an evening of pictures and stories from their nearly 30-year relationship with Taquile Island. The event takes place at the White Salmon Valley Community Library at 77 N.E. Wauna Avenue at 7:00pm. Then on to Hermiston, Oregon: The event takes place at the Hermiston Senior Center, 435 W Orchard Avenue in Hermiston at On Friday October 16 at 7:00pm. Tara Edna is a Hermiston High School graduate and daughter of Irene Miller. She is pleased to finally share her story in her hometown. 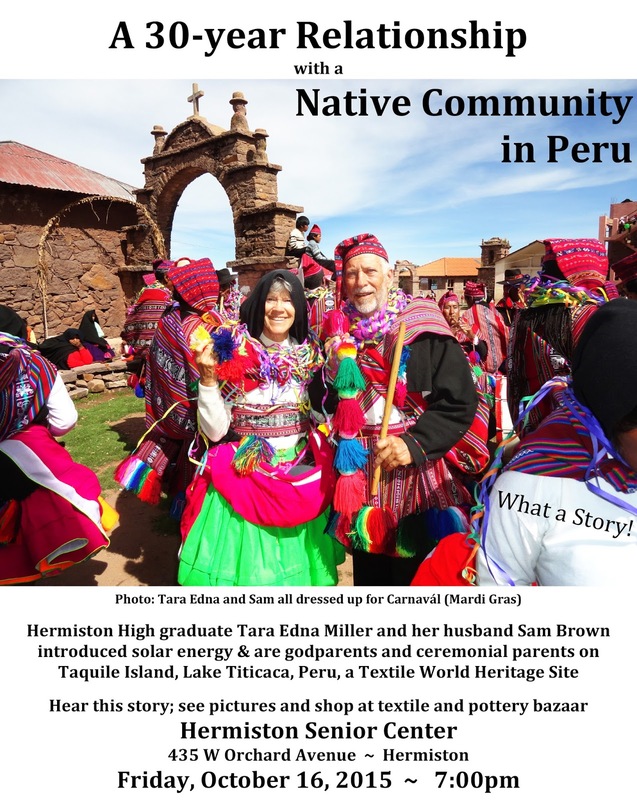 On October 16, Sam and Tara will present an evening of pictures and stories, accompanied by a bazaar of Peruvian textiles and a sampling of Miller and Brown’s pottery. When they first visited as tourists in 1986, artisan potters Tara Edna Miller and Sam Brown found their social peers among the textile artisans of Taquile Island, Peru. This stony island is located at nearly 13,000 feet above sea level in Lake Titicaca. In 1988 they introduced the first solar electric panel and now, not only does just about every one of the approximately 300 households have electricity for lights and music, most of them have gravity-fed running water from community solar water pumping systems. Miller and Brown continue to bring solar technology products, which they trade for the finely made textiles and sell in the U.S. to pay for the project. 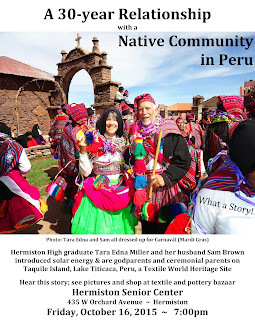 Over the last three decades, they have hosted Peruvians in their home in Colorado two times, visited Taquile 14 times, become godparents to 5 children as well as become ceremonial parents and thence grandparents. It has been a long time since they’ve been tourists.